Why Aren't There More Video Game Sand Castles — In Our Sand Castle Contest? Are you fired up for StarCraft II? Do you like novels good for beach reading? Do you have ready access to a supply of sand? You still have time to enter our sandcastle contest, which ends tonight! Why Aren&apos;t There More Video Game Sand Castles? 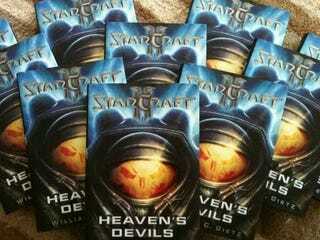 As part of our Summer of Gaming week, Kotaku's giving away 10 hardcover copies of Heaven's Devils by William C. Dietz, the new StarCraft 2 novel. To win, we need to see a picture of a game-themed sandcastle - it doesn't have to be StarCraft II. Put it in the comments of the original contest post, our interns will be sorting through the entries to determine 10 winners. Deadline for entries is the end of today. Remember, you've got to build the sandcastle yourself. No 'shops or pictures taken by others. Check out the entries to see what you're up against already. Though most are at the beach, nothing disqualifies you from building one in a sandbox, or at a park, or anywhere else you can find a pile of the stuff.